We just got back from the vet and Finn is now up to 61 pounds (from 58). His goal is 62-64 pounds, so we're getting there! Finn is excited to see that he still has a little bit of weight to gain, and I'm glad he's gaining it slowly. I got almost no work done on the Franket yesterday. I did get some laundry done, I made copies for Caleb's teacher, I drove him to his afternoon activities, I cooked dinner and then I knit 4 rows. Two lousy ridges bigger is all I got done on the Franket. No point in a picture. I've adjusted my goals for this to what I'd like to call "realistic." Reality has very little place in my knitting blog, but sometimes it just sits up and smacks you in the face. 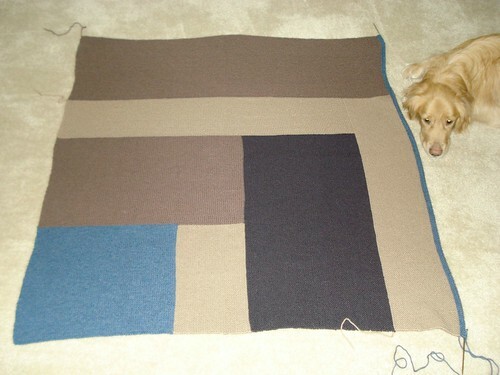 The reality is that there is no way this blanket will be finished by 2 AM Monday morning (midnight PST on Sunday). Ain't gonna happen. 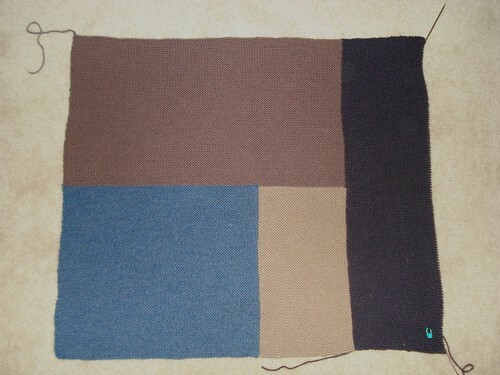 On the other hand, I do think that I can finish the Big Blue Block by then. So that's my goal. Finish the Big Blue Block, I will be amazed at what I've done, but no medal for me. I'm OK with that though because I know that I've done a whole bunch of knitting and I should be proud of that. I'm going to set my finishing goal for the whole giant blanket/monument to garter stitch for 2:00 CST on March 12 because that's the afternoon Caleb gets out for Spring Break. Starting on Monday (March 1 - can you believe it's already almost March?) I won't be working on it exclusively, so you'll get some rotation on the blog through what I have on the needles. I may not be able to blog tomorrow because Finn has to go back to the vet for a booster shot (Leptospirosis) and we're going to check his weight and see how he's doing on that front. I think we may be close to the weight the vet wants him at, but we'll know for sure when I get him on the scale. Have a great weekend! Above is the current state of the Big Blue Block of the Franket. Today I have some stats on the Franket. The Big Blue Block is 200+ stitches per row (not counting the exact number is my secret technique for staying sane - might not be working as well as I hoped). It takes me 7 minutes to knit a row. 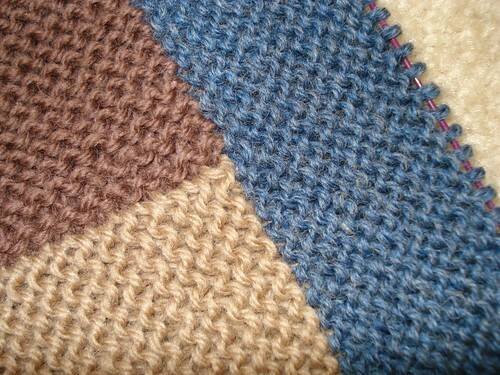 It takes two rows to make a "ridge" (you can see these in the picture - the purl ridges). The Big Blue Block is supposed to have 66 ridges. I've got a long way to go! This is where I'm at on the Franket. (Finn's head included for scale.) The tiny bit of blue you see next to Finn is the start of Block 8. We will not discuss how far off the plan I am at this point. The Olympics end Sunday evening and the Ravelympics end at midnight PST that night (which is 2 AM Monday Morning here). I'm not saying I'm not going to make it yet, but I will admit it doesn't look good. Caleb suggested that I make the Franket smaller but Mickael is 6'3" - not really a candidate for a smaller blanket. Block 8 is to be the same width as the milk chocolate block at the top (Block 7) is tall. It's no lightweight, and it's more than 200 stitches across each row. Today we're going to take a break from Ravelympics Knitting and talk about some other stuff. First topic? Cake! I thought that might get your attention on a Monday morning. Mickael adores Carrot Cake. He loves it and eats it whenever he can. I haven't found a recipe that I'm happy with yet - until now - so I haven't made very many Carrot Cakes, which means he's been stuck trying to track down Carrot Cake in the wild. I mentioned a few weeks ago that I had stumbled across Lucy's blog at Attic 24. It's mostly crochet (in glorious, yummy colors), but she also has recipes (also beautifully photographed) on her blog. One of the recipes she has is Carrot Cake! I thought the recipe looked good and was interested in the non-traditional, non-cream cheese frosting as well, so I tried it out. Now Lucy is in England and apparently when we in the USA declared and won our independence, we decided that we would measure our ingredients for cooking differently too (bet you didn't learn that in school). See we use cups to measure flour - they weigh it! Even Tablespoons, which are apparently found on both sides of the pond, are different sizes depending on which side you're on. So I figured I would just convert Lucy's measurements to American measurements using that all purpose tool, the Swiss Army Knife of the Internets - Google. So I searched for measurement conversion sites. One of them told me that 225 grams of flour was 1 cup. OK, so I thought I'd just double check that on another site because, as we all know, not everything on the Internets is fact. Measurement conversion site #2 told me that 225 grams of flour is 2 cups. Hmmm. This could be a problem. If it was just a cooking recipe, I could wing it and figure it out as I go, but a baking recipe is a whole different story - winging it with baking is how hockey pucks were invented (seriously - a batch of cupcakes gone horribly wrong became the first hockey pucks. OK, I just made that up, but it's possible, you know.) The only option for giving this recipe a fair trial was to go upstairs and get The Scale. So I weighed my dry ingredients, my liquid measuring cups have mL on them, and I had already figured out that Tablespoons in the UK are a little bigger than ours here in the US. But my international baking education wasn't over yet! 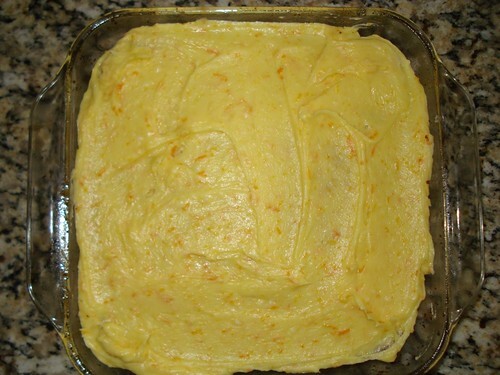 You see, when I went to grate the carrots for the cake, I read in the recipe that it takes about 2 medium carrots to equal 150 grams. So I pulled out 3 medium carrots (so I wouldn't have to go back to the fridge) and started grating. Let me just say that Tablespoons aren't the only thing bigger in the UK! It took me 4 medium size US carrots to get the proper weight. 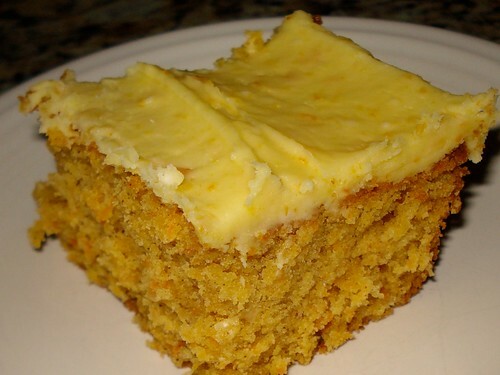 (I think I may have just solved my bunny problem - if I can just explain to them about the wonders of UK carrots...) Anyway, I mixed and baked and frosted and I got the most yummy, wonderful carrot cake! I will definitely be making this one again, but I'll have to pick up some more carrots first. 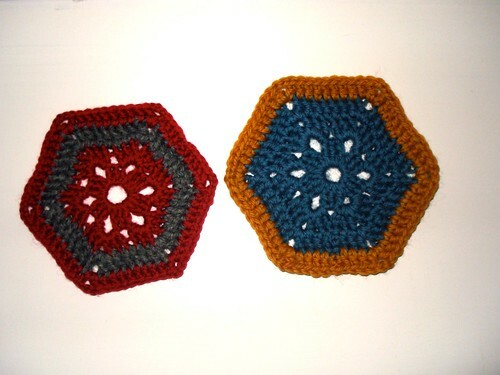 Now that we've covered cake, some history, and cultural differences, I wanted to mention something crochet-y. I will periodically check out new groups in Ravelry and over the weekend there was a new group formed - English Country Garden CAL. It's going to involve a new flower crochet design once a month (starting in March and ending in September) with an optional contest thing involving using the flowers in a design. I thought it sounded like fun and since I have no time and really need to get other things done and I'm in the middle of knitting a monument to garter stitch, I signed right up. Check out the link for more info if you're interested! Tune in tomorrow for a Franket update! it doesn't look like I'm keeping to the pace I've set myself does it? I was supposed to be done with this big milk chocolate colored block (it will be as tall as the smaller one below it when it's done) this morning. I'm not even 1/3 of the way there. I'm hoping to make up time this weekend, so we'll have to see how that goes. In Olympic terms, it looks like I stopped mid race, took off my skates and toodled over to the concession stand for some hot cocoa. We'll see if I can get my act together again and get back in the game! Yesterday's blog entry might have caused some confusion (or not, I don't know). The word "Squeee" is a link. Click it and all will be explained. Or maybe not, again, I don't know. For a completely random change of subject, I have to tell you what Caleb did yesterday. We have a standing rule I call The Duck Rule. There are ducks in the ponds around our neighborhood and Caleb had asked me if he could have one (typical 9 year old). So instead of fighting with him or disappointing him, I told him if he could catch one, he could keep it (these ducks are not the kind that get fed by humans, they just swim around the pond doing duck things). It hasn't occurred to him that this just isn't going to happen. Yesterday we had Lump Birds show up at the bird feeder (most of you will know them as Mourning Doves, but due to their tendency to show up at bird feeders and just sit there - like lumps - Caleb named them Lump Birds when he was 3 and it stuck). Caleb asked if he could have a Lump Bird. I told him Lump Birds could be part of The Duck Rule, so he gets up, grabs the shoes by the back door (my bright yellow Crocs) and tromps outside, hollering at Finn to Sit, Stay on the way out. Even if the bird hadn't had the sense to go sit on the neighbor's roof at this point, he was on the fence when Caleb started this adventure. The fence is 6 feet tall. Caleb isn't. I have no idea how the kid had planned to actually get the Lump Bird if he hadn't scared him off just going outside. Something tells me that this is going to be fun to watch! Today we bring you live coverage from the Living Room Floor. This is the display area for Mickael's Franket - not the place where the competition actually takes place. As you can see, Block 6, lying vertically on the right side of the piece, is now completed and the Pink Lemon is just entering Block 7. Block 7 is the milk chocolate color and it will run along the top. It will be a very wide block, not like the narrow Blocks 5 and 6 at all. The Pink Lemon has given herself 2 days to complete this block (Today and Tomorrow) and hopes to begin Block 8 (another larger, more challenging block) on Friday, to be completed by Saturday night. If she is able to keep to this pace, she feels that she has a fighting chance to finish the Franket on time for medal contention. She is pulling out all the stops for this competition, resorting to taking the Franket to the school pick up line yesterday (it's first voyage outside of the home turf) and is planning to continue "dragging it all over Creation until it's last garter stitch has been completed." The Pink Lemon would like to add that the yarn (Elann's Peruvian Highland Wool) and the needles (KnitPicks Options) are working well together. The simplicity of the garter stitch has enabled her to knit entire rows without looking at her knitting while watching figure skating and giving unsolicited opinions on the outfits worn by the athletes. Most of these opinions have been heard and ignored by the Pink Lemon's coach, Ramius, who says, "The Franket is coming along nicely and it's already more than big enough for a nap. Now get the microphone out of my face so I can go take one." On Friday evening at 8:00 PM CST (6:00 PM PST), I drug the Franket out of the totebag it had been living in (drug as in past tense of To Drag - don't want to get the Olympic Doping Committee excited). I was in the middle of the dark chocolate block, officially known as Block 4 in the Franket Pattern Terminology. I have since completed Block 4 as well as Block 5 (the tan block along the top of the picture. A reasonably dry tennis ball has been included for scale. I had a basic plan going into this (knit, keep knitting), but figured I'd better add a few more details just to keep myself on track. My goal is to complete Blocks 6, 7, and 8 by this weekend. Block 6 is about the same size as Block 5, but Blocks 7 and 8 are both longer and twice as wide. Block 9 will be all next week, which is probably at least as much time as I'll need since Block 9 is about 1/3 of the total Franket. No definite plan for the border at this point. 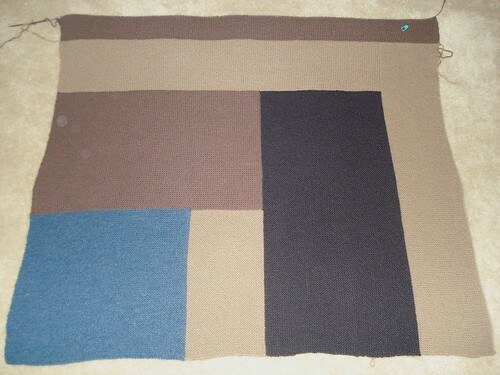 I have just realized that I will need to do a blanket/mat for Finn to sleep on after the Olympics. He is currently curled up on one of the towels we put down by the back door to dry him off and catch the snow he shakes off when he comes inside. Clearly, he feels that the doormat by the back door isn't worth sleeping on when there's a big towel laying there. Yesterday was a snow day (as is today) and we really did get snow out of it! We got about 8 inches here in fact. Caleb was thrilled to get a 5 day weekend (Monday is President's Day), but Finn really took advantage of the weather. He bounced around, ate snow, shoved his beak into the snow, ate some more, wagged a LOT and ate some more snow. I think he's trying to eat all the snow out of the backyard! It's a perfect start to the Winter Olympics tonight, although I've heard Vancouver is looking for more snow up there. I've said it before and I'll say it again - our family loves the Olympics. I don't really watch sports, but if it's the Olympics I'll watch whatever they're showing. Major sports like skating and bob sledding, or obscure sports that no one's ever heard of - I'm there. As a knitter, I'll be participating in the Ravelympics*. I thought and thought about what I'd do for the Ravelympics, picked a cardigan, picked another cardigan, went back to the first cardigan, thought about designing a pattern for a small shawlette , and then decided that I'd do a Work In Progress. 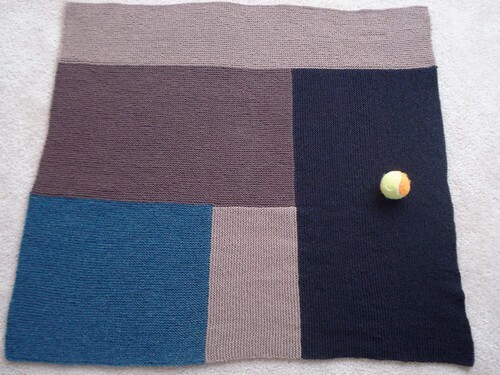 Last June I started knitting the Moderne Log Cabin blanket for Mickael. I was making it to match our media room which we call Frank - it was to be Mickael's Franket. (We can't really take credit for naming the room Frank. When Rick and Mindy bought their current house a couple of years ago, it had a media room. Mindy didn't want a room called a "media room" so Rick named it Frank. We recognize pure genius when we see it and asked if they minded if we named our own media room Frank. It's just a much better name.) The Franket was supposed to be part of Mickael's Christmas gift. Caleb helped me pick colors and for a couple of weeks I was off and running. Then it kind of ground to a halt. It's big enough that it's not really portable and I could only work on it when Mickael wasn't around. I realized a couple of weeks ago that the Olympics would be perfect to finish up the Franket. It's easy to knit while watching TV and it will definitely be a challenge to get finished on time, but if I can finish it, then it will be done and Mickael can have it. I asked Caleb what he thought of my idea and he agreed that it was perfect, so I pulled it out, showed it to Mickael - he loves it - and tonight, when the Opening Ceremonies begin, I will start to finish Mickael's Franket. *Just in case you aren't familiar with the concept of Ravelympics, the idea is to knit/crochet/weave/spin/design a project from the Opening Ceremonies of the Olympics (6 PM PST tonight) to midnight PST, Feb 28 (after the Closing Ceremonies). The project should be a challenge because the athletes have trained their whole lives to get to the Olympics where they will challenge themselves to the best of their abilities and as knitters, we are supposed to challenge ourselves in honor of the athletes. Or something along those lines. Just a note, over the next 16 days of blogging you will be seeing a lot of the Franket. Hang in there and maybe Finn and Ramius will pop in periodically to break up the monotony of a garter stitch blanket. Thanks for all the complements on the quilt top. You guys are great! I've done a few more blocks for The Babette (6 new small ones) and I was beginning to feel like I had a pretty good handle on it. Things were moving along pretty quickly, I was cranking out blocks regularly, and I had done quite a few of the number of blocks required by the pattern. Now I knew that I wanted the throw to be bigger than the pattern called for (so I'd need more blocks), but I didn't really have a plan other than make lots of blocks and see what I've got. That's pretty standard operating procedure around here at Chez Pink Lemon and it usually works out without any major issues. As I was making blocks though, I realized that if I made too many of one size of block or needed more of the bigger blocks and didn't have enough different yarns at the end to make them interesting, I'd be in trouble. It was time to start figuring out a plan. So I measured the tiny blocks (since the bigger blocks are all multiples of the tiny ones) and figured out how big I'd like the throw, drew it out on graph paper and started drawing in blocks. I started with the biggest and worked my way down to the smaller blocks and then began filling in with the small and tiny size. That's what you see on the right there - the beginnings of a plan. I'm keeping count as I add blocks to the plan, so I know how many I'll need to make to do the plan. Obviously, I'm still working on the plan. I'm seriously considering making the plan a bit smaller, but I haven't decided yet. For now I've got to keep making blocks. A lot of blocks. Over the weekend, I sat down to work on the quilt top that I drug out of my stash closet a few weeks ago. I had originally planned on having 8 rows of 10 blocks each, but that was before we got The Big Mattress. Luckily, I had 9 extra blocks left over so I sat down at the sewing machine and made another block so I could add another row to the bottom of the quilt. Monday is Clean Sheet Day around here, so while the bed was stripped I carried the top in and spread it on The Big Mattress to get some measurements. I love the way it looks already, but there must be borders! 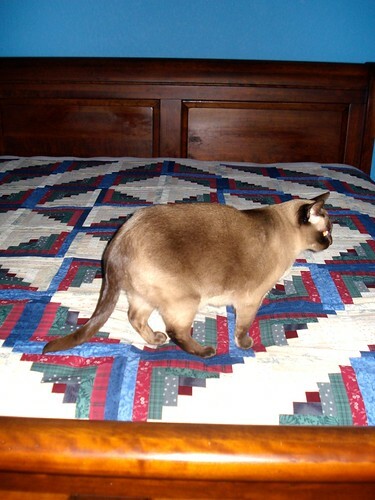 Ramius even came to help, or at least walk around on the quilt top the way cats like to do. The next step will be to check what kind of yardage I have left from the blocks and figure out my borders. I realized as I was typing this that I hadn't mentioned any real details about the quilt top, and since this really isn't "officially" a quilt blog (although I guess the "...and my crazy life." header leaves my options pretty wide open), there might be some of you out there that don't know anything about quilts. This is a Log Cabin quilt (you can see a single block at the top of this blog post), which is one of my favorite designs for a couple of reasons. 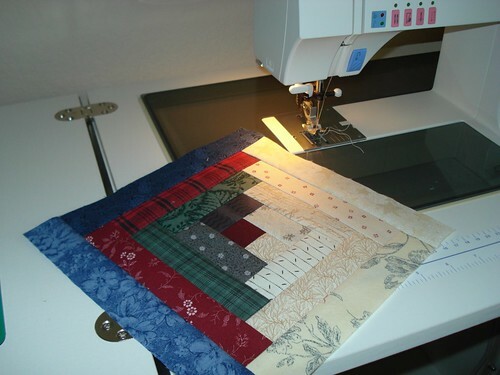 The Log Cabin was the first quilt I ever made, when I took a class in Waco, Texas (the shop is no longer in business) after Mickael and I were married. Also, the Log Cabin block, while using lots of fabrics, has a light side and a dark side if you divide it diagonally. This gives you lots of different ways to arrange the blocks, by simply turning them different directions. The layout I used has a star in the center and then radiates out from that in what's called the Barn Raising layout. My Log Cabin blocks have dark red centers - the red symbolizes the hearth of the home. Yellow is also a popular, traditional center pattern, symbolizing a candle in the window. 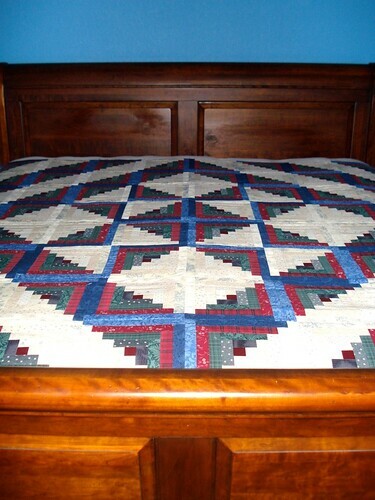 There is a myth that Log Cabin quilts with black centers were used to mark stops on the Underground Railroad, and while it's a charming story, quilt historians have been unable to find quilts with black centers (or record of such things) dating from the correct time period. And I'm not just talking about the Saints win (although that's great too!) You see, 15 years ago yesterday, someone was born. He was a tiny someone and he couldn't see or hear yet, but soon he became stronger, bigger, sassier, and far more opinionated. Soon he became part of our family. 15 years ago, on February 7, in Spring, Texas (just North of Houston), Toytown's Ramius Houdini was born. We just call him Ramius around here. It took us a week to pick out a name for him. I wanted to name him Drake, but Mickael wanted to name him Ned. Neither name was right so we kept thinking and then one night we were watching Hunt for the Red October and Sean Connery's character was named Marko Ramius. We looked at each other and knew that his name was Ramius. We added the Houdini for his registered name because he had a tendency to appear randomly where you were pretty sure he wasn't. I'd see him downstairs, go upstairs and find him in the upstairs hall taking a bath. We've never been sure how he did that trick, but he did it a lot. We figured he was either being transported a la Star Trek or he had Houdini-like talents. 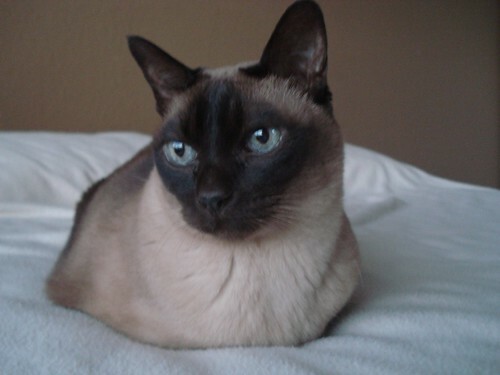 The first part of his name is the cattery he was born in - Toytown Tonkinese. Random bit of mostly useless information: unlike dogs, which you can name anything as long as it's different from everything else ever registered in the AKC, cats have rules for their registration names. The first part of their name is the cattery of their birth, then comes whatever name you want (although there are some rules as to what you can and can't use here too - mostly regarding place names if I remember), then that's it if you aren't a cattery (we aren't), but if you are, then the word of is added along with the name of your cattery. For instance, if my blog was a cattery, he would be Toytown's Ramius Houdini of Pink Lemon Twist. By doing this, I can look at Ramius' pedigree and see where his ancestors were born as well as where they lived, just by looking at their names. That concludes today's lesson. I had to use a picture from a couple weeks ago since it's pouring rain here and it's very dark - there's no way I'll get a good picture of him this morning. Happy Birthday Mr. Kitten! Since I've finally gotten back to spinning around here, I realized that I needed a place to put my water while I was spinning. I have a small table that sits next to me while I spin, but I didn't have a coaster to put the glass on. "Hey!" I thought, "I can make one of those!" So I grabbed some leftover worsted and my little crochet motifs book and made a coaster. This is motif #30, but I did a double crochet border instead of a single crochet border like the pattern calls for - it needed to be a little bit bigger than it was. Then I realized that Caleb might like a coaster to put a glass of water on, or he might do something else with it, but since he'd been asking for a crocheted thing, I grabbed some red (his current favorite color) and some grey to go with and did one for him. His is DK weight and I used the same hook (I don't have very many different sizes of hooks, so I just use what I have) - you can see the size difference that just the yarn weight makes. These were fast little projects and while mine is functional, I'll have to see what Caleb uses his for. It could be a coaster, or it could be a hat for a toy, or a spaceship, or who knows what he'll use it for - that's the fun in being 9. Have a great weekend and Go Saints! 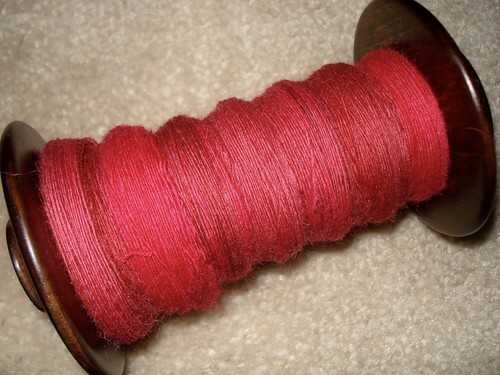 I've started on the second bobbin of BFL, but I haven't gotten very far. I wasn't even sure if I was going to bother with putting this on the blog today, but I really didn't have anything else to show. Finn and Ramius are both curled up asleep (not together) since it's a cloudy, dark, rainy day here and I can't blame them, but I don't want to wake them up to use them as blog fodder either. I just haven't had a lot of time this week for fibery fun. What have I been doing? Sorting out stuff for taxes. So. Much. Fun. 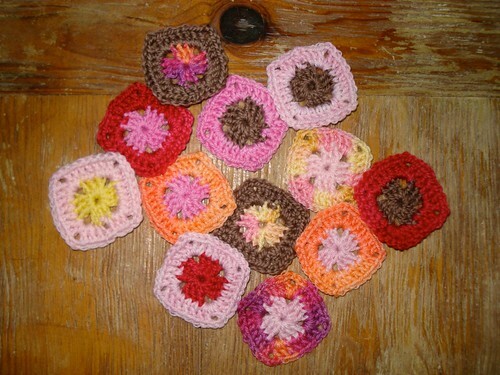 I've been working on a few of the tiniest squares for The Babette. 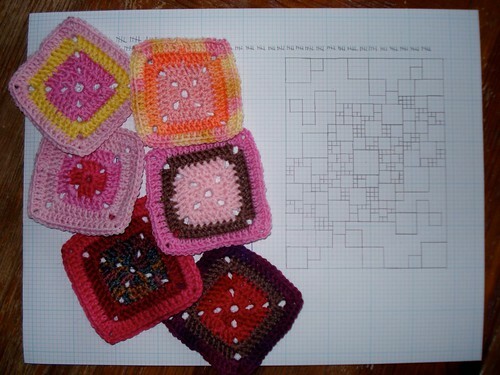 I've just finished a dozen of them and this brings my total number of squares (of all sizes) up to 40. If I'm remembering correctly, as the pattern is written, I'll need around 120 squares, but since I'm making The Babette bigger than the Babette in the original pattern, I'll need more than that before I'm through. When I'm doing this tiny size of block, it almost takes longer to weave in the ends than it does to make the little blocks. Caleb is fascinated by these for some reason and keeps asking if he can have one. I will need to make him a Babette or something using squares in more manly colors. Today is my 5 year Blogiversary! Yes, 5 years ago on Groundhog Day (great holiday, really great holiday!) I started my blog. This was before Ravelry folks, if you can remember back that far. Some posts have flown off my fingers, some posts have been a fight. When I started I had just begun spinning and I didn't know a thing about crochet. I'm more confident in my spinning, and I know enough crochet to know to get the book out and look things up before I do anything. Ramius has blogged. And then Finn joined in. When I started blogging Finn wasn't even born yet. 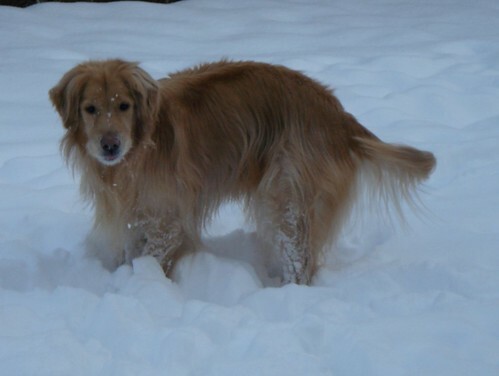 In fact we had Bear at that time, our first Golden Retriever. I never put Bear on the blog because he was going downhill quickly and I just couldn't share him with the blog and then have to explain when we made the toughest decision a pet owner ever has to make. I didn't know if anyone would read this blog and I didn't know who they'd be if they did and I just couldn't put that much of me out there on the Internets. Bear was 10 weeks old when Mickael and I started dating and he was 100% sure that I had actually given birth to him. 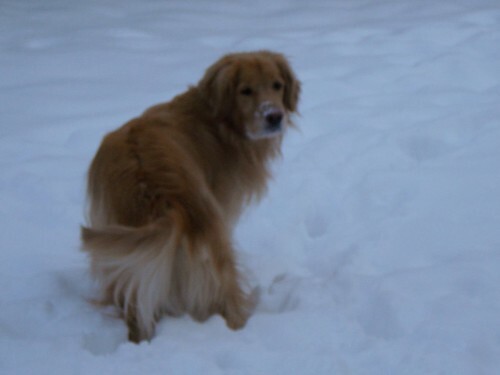 He was a dark red Golden and he was 80 pounds of muscle and wiggles. He had food out all the time and only ate what he needed. (Finn would eat until he explodes and then he'd try to eat some more.) Bear's weight, once he got to a full sized dog stayed between 79 and 81 pounds his whole life until the last year or so, when he started losing weight. Bear loved to go swimming and was the first Gibbons dog to go off the diving board willingly. Bear knew how to turn on the hose to get a drink of water and as much as he watched our hands and feet when we drove, I'm pretty sure that if he could have, Bear would have driven a stick shift pretty well. He loved turtles but was afraid of the dark. He would chase armadillos and thought it was funny when cats ran up trees. Bear loved Ramius and would allow Ramius to lecture him, but he wouldn't play with Ramius until he was almost full sized. It's like Bear knew that Ramius was tiny and could be hurt. He even let little kitten Ramius eat all the whiskers off one side of his face. (We put a stop to it as soon as we realized what was going on of course.) Bear fell head over heels in love with baby Caleb when we brought him home from the hospital and tried to trade his toys for Caleb. When he realized that one toy wasn't going to be a good trade for baby Caleb, he brought me combinations of toys, trying to find the magic mix of squeaky toys and wooly men so he could have the baby. The day Caleb learned to roll, Bear changed his mind - Mickael and I could keep him. More than once Bear gave Caleb a soft place to land when he rolled off the sofa since Bear would sleep next to it. Bear was a huge part of our lives and while I wasn't planning on writing this blog post all about him, it's fitting that I share a tiny bit of who Bear was with you. You guys would have loved him. In knitting news, I'm still working on Cassidy. I'm doing increases now and I'd love to finish the fronts this week. I'm still hoping to finish the whole thing by next Friday before the Olympics start. I'll be letting you know next week what event I'm doing - gotta swatch first! Finn appreciates all the well wishes for his weight gain, naturally. When we first found out he was overweight, the vet said to keep him on his regular food because at his age then (and now) he wouldn't have any trouble getting his weight down. So, he's never been on a reduced calorie food, I just needed to adjust his amounts a bit after he lost the weight so he wouldn't keep losing weight. I've increased his amounts by 1/4 cup a day and we'll see how he does with that for a bit and I'll increase it more if we need to. Just like weight loss, it's important to gain weight gradually too. That means no Sonic or Whataburger for the little fuzzy baby. 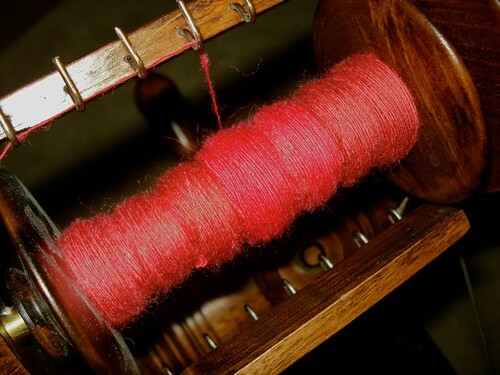 I finished my first bobbin of Fleece Artist BFL and have started on the second. I've got some more BFL in my stash that I think I'm going to pull out when I finish this. 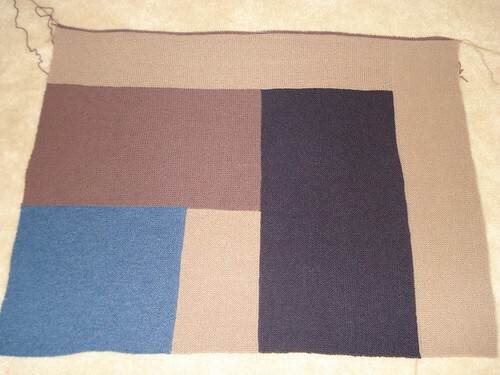 It's not from Fleece Artist, but from The Fiber Denn. Delia does a great job dying fibers and when it's finished, there isn't any matting or clumping as you tend to find on fibers dyed in roving or top state. I've cleaned up the Got Fiber listing in the sidebar and added The Fiber Denn to that list for a quick link. Finn went to the vet for his yearly on Friday and he got some really great news! He's over all healthy but he only weighs 58 pounds. The vet says this isn't dangerously thin, but he could use a little more meat on his bones. So, Finn gets to gain weight! He's supposed to come up to 62-64 pounds. You can feel Finn's ribs (which you're supposed to be able to do), but you can also feel his spine (which you're not supposed to do). Like I said, he's not unhealthy, he just needs a little bit more in the way of reserves. When Finn was about 1 year old, he weighed 80 pounds and had to go on a diet. He did a great job losing the weight, but clearly we haven't figured out exactly how much food to give him to keep him at a healthy weight yet. I've increased his food a bit in the morning since he mostly settles in for the evening after dinner and we'll see how he's doing. Finn suggested that we stop off at the Sonic and get a cheeseburger on the way home from the vet to kick start his weight gain, but I think we're going to do it with kibble instead.